Ten tracks that bristle with energy and are, as a rule, short and to the point. Have you heard the one about the three Swedes, the Italian and the Irish woman? No? Well, you should certainly make a point of hearing one by them. Thundermother are an all-female five-piece who are, by all accounts, ready, willing an' able to grab you by the unmentionables and make a mess of your head. They are the stuff of AC/DC-inspired Rock 'n' Roll dreams, and if I was still eighteen, I suspect I'd want to party with these gals all night long. 'Road Fever' is their second album following their 2014 debut 'Rock 'N' Roll Disaster' which crashed into the Swedish Charts at Number 2; with a bit of experience now under their belts, the girls now plan to push the pedal to the metal and take on the world. '...Fever' features ten tracks that bristle with energy and are, as a rule, short and to the point. There's no messing around here as the album motors along with neither pit stops nor unnecessary dirt track diversions. 'It's Just A Tease' is a lively opener, with Clare Cunningham's gutsy vocals instantly bringing to mind a young Jody Turner (Rock Goddess) with the twin guitar attack of Filippa Nässil and Giorgia Carteri really revving it up. 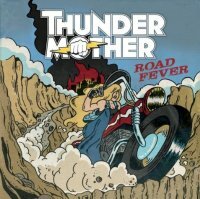 The power of the rhythm section – Tilda Stenqvist (drums) and Linda Ström (bass) – is also apparent, as the band romp through a clutch of "traditionally" titled Rockers such as 'FFWF (Fight Fire With Fire)', 'Deal With The Devil', 'Roadkill' and 'Thunder Machine'. Throughout there's a real sense of togetherness – a band comfortable with itself, its sound and its direction. Highlights include the meaty riffing of 'Enemy', the catchy sing-a-long-ability of 'Give Me Some Lights', the mid-paced Blues Rock of 'Vagabond' and the joyful, almost danceable, battle-cry of 'Rock 'N' Roll Sisterhood'. You also get the sense that there's plenty more in the tank – that this is a band that can only get better as they hone their song-writing skills. The trick will be to maintain the freshness, the raw edge and the obvious fun and enthusiasm. "These Hard Rock chicks will blow your head off!" stated the press release. Empty promises? Well, you get the distinct impression that we're dealing girls who like to deliver. They fully deserve ten out of ten for the energy, the full-on ballsy sound and the vibe, but I'd possibly only award seven out of ten for the songs.